The Jazz came close…only to fall again in the Staples Center. How close? From the 10:30-mark on (from the 3rd), throughout the rest of the game, the Jazz never trailed by more than 6 points. Oftentimes, only down one or two. We tied the game on four different occasions in the 2nd half. But could never take a lead and get over the hump. During a few offensive possessions when the game was tied-up, the Jazz turned the ball over on a traveling call, a missed lay-up and a bogus offensive foul-call (I’ll save the ref-complaining for later). For some reason, we couldn’t take control of the game. I’ve got to believe that the Staples Center owns some sort of weird, mysterious hex over the Jazz, because we were so close, and yet still couldn’t pull out the victory. The game was there for the taking! Boozer struggled again. Even with solid numbers, he wasn’t stellar. I think we expect him to be a superstar performer for us. And yet, he hasn’t risen to the occasion. Odom and Gasol outperformed our big guys (combined 43 pts & 19 rebs vs our combined 41 pts & 25 rbs), coming up with bigger plays down the stretch. Pau Gasol’s slight shove, and put-back dunk was proof of this fact (even though it should have been called as a foul). In my opinion, this became the tale-telling sign of the game. It was painfully obvious that Booz and Okur couldn't guard the Laker post-guys in the paint, nor on the perimeter. CJ Miles showed us some spark during the 3rd quarter. He had a sweet dunk over Lamar Odom that was quite impressive. I’ve always wanted to see more of CJ in the game. He’s got some great 'hoop'ability. However, I’m not sure he’s able to defend any better than Harpring or Korver. With every game that goes by, Deron Williams becomes the face of the franchise; clearly "the man". The good sign from Game 5 is…we know that we can compete at the Staples Center. Game 5 was our best road performance of the series, even though we didn't win. We're in good shape going into Game 6, being that our competitiveness has heightened. We ought to take away a great amount confidence while playing at home, to win the next game. We should have won last night. All we needed was a half decent game from Boozer. He is absolutely killing us right now. That being said, we can compete with the Lakers and still have a shot in this series. 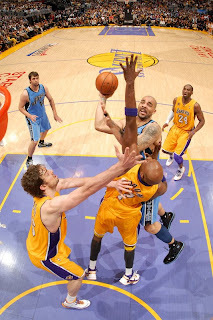 Gasol is soft and D Will is killing whoever they put on him. But I agree -- we eventually HAVE to have a "big" off the bench who we can get something out of. It's clearly not Collins. Fes, Fes, when will you be able to contribute? The frustrating thing about the Jazz right now is that they can compete with anyone, but I'm not sure they can win it all with a front court that can't defend against anyone. Good points. And why do we let Kobe cheat so far off of his man? When he doubles on Boozer, his man needs to make him pay. Make him play some defense on that bad back. We're going to stomp them in game 6 and get over the hump with a land mark victory in game 7.